Will the Class of 2049 be the last class ever? Lucy and her boyfriend have been planning an epic post-graduation trip for months, despite the unstable world they live in. But when everyone’s phones start to ring during prom, Lucy knows something terrible has happened - something new. Decades of climate change have taken their toll, religious extremism is spreading, refugees have nowhere left to turn, and terrorism is common. But this is worse. Far worse. 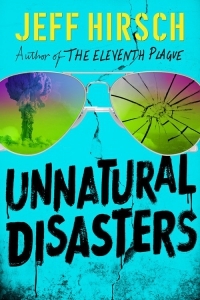 An unforgettable story about teens finding their way in a world the adults have destroyed, Unnatural Disasters is an ultimately hopeful tale of survival, identity, family, and love. From a bestselling author, an edgy, voice-driven novel set in a not-so-distant-future world about teens trying to survive when attacks by an unknown terrorist organisation throw the entire planet into chaos. Just right for fans of Tommy Wallach's We All Looked Up.